"To me the Court Central looks slow and that will play into the hands of the counter-punching Simon..."
Tuesday's play at the Palais Omnisports yielded one winner and a tough loss from my two recommended bets. Nicolas Mahut completed a miserable season for Alex Dolgopolov by coming back from 2-6 down in the first set tie breaker to seal a 7-6, 6-1 victory after his doubles partner Michael Llodra was beaten from a set up by Grigor Dimitrov. Mahut knocked any lingering fight Dolgo had left in winning that breaker, while Dimitrov showed some rare mental toughness in coming back from a set down to take out Llodra, who would have made a nice profit for Cash Out backers, but couldn't see the job through. 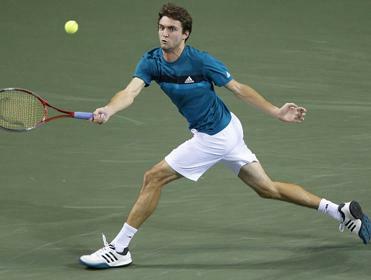 The second round continues in Bercy on Wednesday and it's not been a good tournament for the French so far, with several of their main hopes and plenty of no hopers already out, but they are guaranteed at least one through to the next round when Gilles Simon faces Mahut at around 11.30am. I suggested backing Simon in my outright preview and after a pathetic display last week in Valencia we should see the best of him here with semi final points to defend from last year. That loss in Valencia to Alejandro Falla wasn't exactly a shock given that Gilou hasn't won a completed match there since 2010 and he was surely saving his brittle body for this week. There have been wildly conflicting views on the court speeds in Bercy this week, but to me the Court Central looks slow and that will play into the hands of the counter-punching Simon when he faces Mahut for the sixth time in total today. The pair met in Metz a couple of months ago indoors and Simon was always in control of that match and I expect the same again, with Mahut really needing quicker conditions to get the better of his compatriot. I also like Ivan Dodig to end the season strongly against the questionably committed Nico Almagro, who has an awful record at this time of the year and is 3-6 here in Bercy. For me, No 1 Court seems faster and Nico won't enjoy the pace coming at him from Dodig in any case, as he loves to prepare for those big ground strokes that can be so devastating on clay. Almagro defeated Dodig on clay in Barcelona this year, which you would expect, but his overall record on indoor hard is a losing one and if Dodig has enough left in the tank he should come out on top in what could be a tough match. There again Nico might decide that he's had enough early on, but Dodig you can be sure will give his all. Rafa Nadal makes his first appearance in Bercy since 2009, which tells you all you need to know about how seriously he takes this event, but he has been given a comfortable draw against Marcel Granollers, who Rafa should defeat easily enough. Nadal hasn't played since getting thumped by Juan Martin Del Potro in Shanghai though and he may start slowly, so the [19.0] about Rafa being extended to 7-5 by Granollers looks a good Cash Out opportunity.